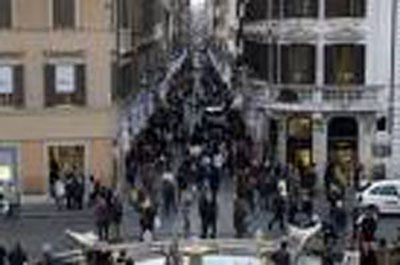 Considered in the sixties the meeting point for the most popular of the Dolce Vita, now the famous Via dei Condotti was described by Vogue magazine the 5th Street most prestigious into the world of the luxury shopping. 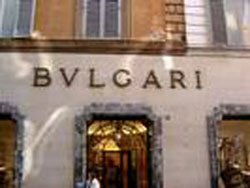 For the lovers of fashion and beauty the greatest signatures, leather goods and jewelry must have a boutique in this wonderful street, a showcase that can enhance the prestige and status. On a long avenue of luxury, offering sumptuous extreme every kind of product dedicated to a target of Elite: here you can also find shoes from 2000 EURO each. Special and unique in these stores you can also find items whose manufacture is reserved for the chosen few as made in limited numbers. Those few meters, which make up this avenue are outlined on the one hand from the splendid Piazza di Spagna, which highlights the beauty and amplifies the surreal atmosphere and on the headquarters of Fendi sisters.You can found greats brands like Louis Vuitton, Luisa Spagnoli, Hermes, Bulgari, Damiani, Prada, Christian Dior and many many more. In the period of balances these stores are forced to set up barriers and security people to adjust the flow of potential buyers or just curious people who go to these structures in order to gain a designer piece at a price of occasion. Without doubt in this place appear to prevail upon an extreme look that only the branded product has to offer, and as in every age a chance to show can be an added value to ego. The spectacular productions produced by these shops to decorate their windows, may be think to be in an other world. 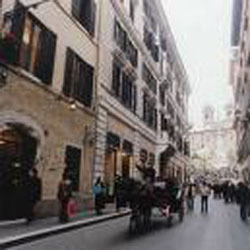 For lovers of luxury, beauty, the splendor is impossible not to walk in Via dei Condotti, once arrived in Rome. Among the many shops, located one after the other, you can also find the famous Greek Cafe become known over the years and considered one of the most refreshment “inn” of the Capital. In addition to historical, coffee is famous for its many famous visitors had over the years has been for a long time, and partly still is, a meeting place for intellectuals. It meets once a month, the group of Roman scholars and academic experts in particular of the city of Rome. El Matha, I love your new blog in all its dnieismons! Good writing, wonderful content, and your photographs are high art. Here in Boulder I’m still decked out in the uniquely classic fashions you orchestrated. Congratulations on your new ventures. SleepingRome offre le migliori soluzioni di alloggio in appartamento e bed and breakfast a Roma.